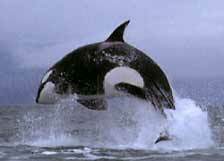 Orcas are the totem species of northwest Washington and coastal British Columbia. Their playful leaping, diving, spyhopping images adorn coffee mugs, t-shirts, boats, beer bottles, kayaks, long-houses, totem poles, baseball caps, sculptures and ferry landings. And if a group of school children in Washington State have their way, orcas may soon grace the state's licence plate as well. The killer whale is a mainstay of our tourist economy, our love of the ocean, and our sense of brotherhood with other species. Without orcas, human life in the Pacific Northwest would be greatly impoverished. The future may be without orcas if action is not taken soon. A combination of PCB poisoning, declines in salmon (a favorite orca prey), general ecosystem deterioration, growing whale watching pressure, and the lingering effects of many whales being captured for display in the 1960's and 70's, has caused the population to plummet almost 20% in the since 1996. Add in the constant threat of oil spills, boat collisions, fishing net entanglement, strandings, and disease, and you have a recipe for the extinction of one of North America's most magnificent and charismatic species. The small size of the population and its recent catastrophic decline qualify it for listing as "endangered" under the strict scientific criteria established by the International Union for the Conservation of Nature. It was listed as "threatened" by the British Columbian government in 1999, but still lacks federal protection in the United States. 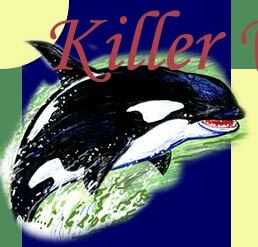 With its current population trend, the Puget Sound killer whale will likely go extinct within 33 to 121 years. The median time to extinction is 74 years. If habitat conditions improve, it has good chance of surviving over 300 years. For more information, see the Center's July, 2001 Population Viability Analysis. To help save Puget Sound's orcas (known to scientists as "southern resident killer whales"), the Center for Biological Diversity brought together a population ecologist, a toxicologist, and an endangered species activist to study its life history, habitat needs, population trends, and threats to its existence. We also brought in a lawyer to review legal mandates for the protection of imperiled species. 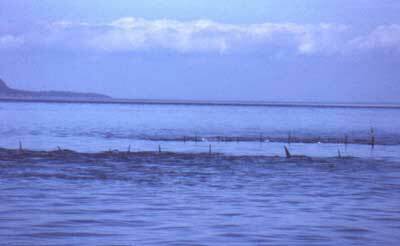 This diverse group produced the first ever population viability analysis (PVA) for a population of killer whales. 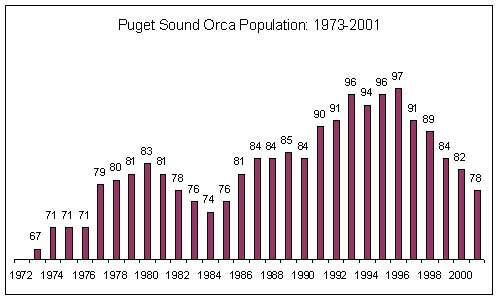 The PVA, a complex computer model, showed that if current population trends continue, the Puget Sound population will go extinct within 100 years, possibly as soon as 30 years. Even if birth and death rates are averaged out over the past several decades, the orca's risk of extinction is greater than 50% in the next 100 years and 99% in the next 200 years. Just one or two oil spills, strandings, or disease outbreaks per century dramatically increased the risk of extinction. When meeting each other after a long absence, killer whale pods sometimes form a ritualistic line and touch noses. The Center's population ecologist, Dr. Martin Taylor, traveled to Rome in June, 2001 to help the International Whaling Commission develop similar models to predict the impact of habitat loss on cetacean (whales, dolphins, and porpoises) populations around the world. Considering the high probability of extinction, the Center's science and legal team next developed a comprehensive petition to list the Puget Sound whales as "endangered" under the U.S. Endangered Species Act (ESA). The ESA is our nation's strongest environmental law. It mandates federal recovery plans for all listed species, prohibits killing and harassment, establishes protected "critical habitat" areas, and ensures that all federally permitted activities (shipping, fishing quotas, development permits, etc.). Listing under the ESA is the first step to recovery, not only for the orcas, but the entire Puget Sound ecosystem which is deteriorating under the pressure of overfishing, pollution, coastal development, upstream logging, and marine traffic. The petition was filed with the National Marine Fisheries Service by the Center on May 1, 2001, on behalf of a coalition including the Center for Whale Research, the Whale Museum, Ocean Advocates, Washington Toxics Coalition, Orca Conservancy, American Cetacean Society, Friends of the San Juans, People for Puget Sound, Cascade Chapter of the Sierra Club, Project Sea Wolf and former Washington Secretary of State, Ralph Munro. An initial finding on the ESA petition is due August 1, 2001. If the Fisheries Service determines the petition is based on solid scientific data, it will have until May 1, 2002 to issue a formal listing proposal and until May 1, 2003 to finalize federal protection. Once the listing is complete, the Center will help develop a federal recovery plan for the orca. In the meantime, we are working to identify important areas for potential designation as critical habitat. These will include areas used by the whales, but also by their prey species and the entire food chain linking whales to salmon, salmon to herring and copepods, both of these to eel grass beds, and eel grass beds to water quality and sea bed conditions. The development of the listing petition provided an opportunity for scientists and environmental activists to draft an initial set of orca conservation recommendations. Over the next several years the Center will work with its conservation partners to flesh out and expand these recommendations, hoping to form the basis of conservation efforts at the county, state, federal and international levels.